Oh, who am I kidding... I've been phoning it in from the beginning! Road Trip Costume by Disney's Spoonful. Such a comfortable costume-- and my son loves cars. Homemade by Jill's baby Aerobics Instructor. This is super adorable, and I probably have everything on hand-- including an old boombox to take the place of that super cute felt one she made. 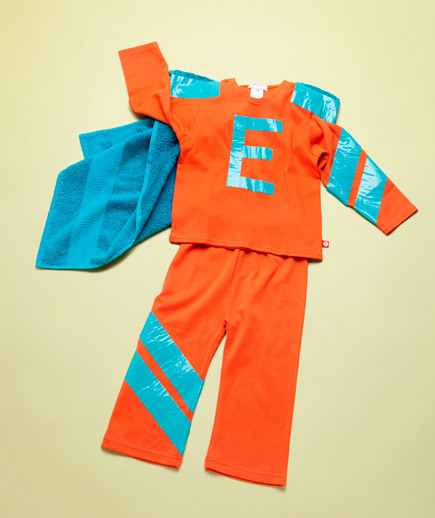 Both kids would love these superhero costumes from Real Simple. You could even use solid colored footed pajamas-- and I've seen funky duct tape at Walmart. Hoodie Costumes from Martha Stewart. There's even a frog and princess! Finally, I just love this Charlie Brown costume from Not Enough Hours in the Day. I'd definitely find the motivation to make my daughter a matching Lucy dress. I feel my motivation rising just by writing this post! How are you feeling about Halloween this year? he looks so different as a baby! Your son is just darling in that outfit! It's a perfect fit. Love your blog name and website domain name, by the way! P.S., I've linked back to you. Your blog is gorgeous. Not enough hours-- Thank you! Blogging is a ton of work especially alongside parenthood! I wish I had a few more hours in the day too! I'll be crossing my fingers that your son cooperates for a picture too-- I want to see the costume!!! OOOOH I *love* the baby Harry! I'm so glad someone got it! He was just over a month old so I just drew a zig zag on his forehead with eyeliner. Lazy mama!